I thought it would be great to share with you one of my favorite side dishes to bring along to family potlucks and holiday gatherings – Apple Slaw with Celery Root. I love that you can make this apple slaw ahead of time and that it doesn’t require refrigeration, meaning that it can sit out for a bit while all the grilling, socializing and games of corn hole are happening. You can serve this apple slaw as a side dish with barbecued chicken or steak, or try topping a saucy pulled pork sandwich with it. The crunch is just so delicious and the tangy pickled onions in this apple slaw are the perfect compliment to a sweet BBQ sauce! To make those pickled onions, the process is really simple. I just add some vinegar, sugar and a pinch of salt to some thinly sliced red onions. Give them a good massage and let them hang out for about half an hour. They’ll take on the most delicious tangy flavor and will add such a bright quality to this apple slaw. Since it is an “apple” slaw, I like to use a good-quality apple cider vinegar for pickling those onions. 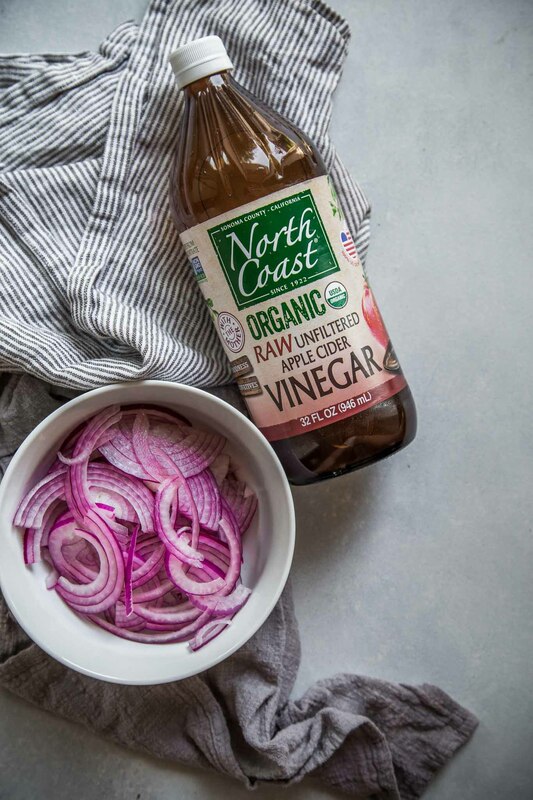 My favorite is from North Coast – their organic apple cider vinegar is unfiltered and it has that great bite that I’m looking for when I’m pickling onions or making a yummy vinaigrette. What kind of apples should I use for apple slaw? For this apple slaw I used granny smith apples. I love their tanginess and crunch in this salad. However, you could use any red or green apple that you prefer. Fuji apples and Gala apples also work well here. Celery root, also called celeriac, is a brown-skinned, round root vegetable with a knobby, uneven surface. The interior is a creamy white color and tastes like a cross between celery and parsley. Despite its name, celery root is not the root of traditional celery. Instead, it’s cultivated specifically for its root. How do you eat celery root? You can eat celery root in its raw form, as in this apple slaw, or you can cook with it. Celery root produces amazing soups and stocks, or you can braise it alongside a roast. What can I substitute for celery root? If you’re unable to find celery root in your store, you can substitute regular celery in this apple slaw. Instead of the one large celery root, you can use four stalks of celery. Can I make apple slaw ahead of time? Tossing the apple and celery root with lime juice in this recipe prevents browning and allows you to make this slaw up to 24-hours ahead of time, which makes it a perfect dish for bringing along to potluck gatherings or holiday dinners. 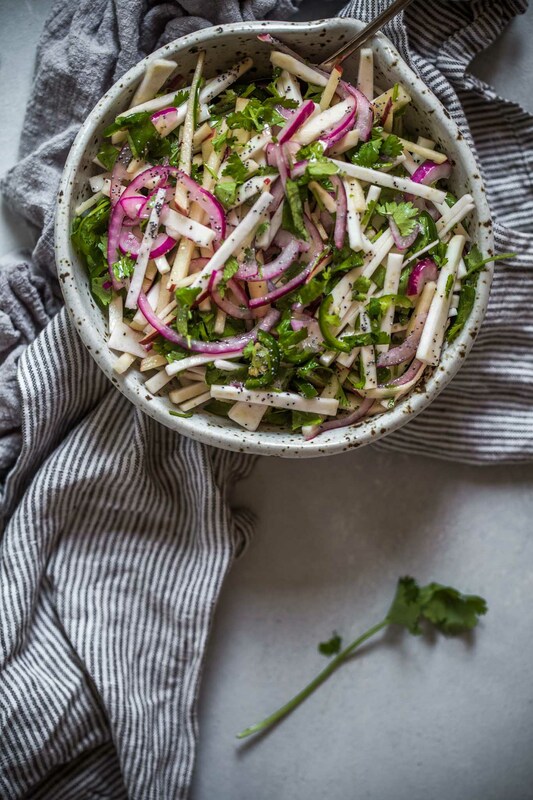 I hope you enjoy this Apple Slaw with Celery Root as much as I do! Be sure to enter to win a full year’s supply of North Coast Apple Products here (ends 11/30/2018). 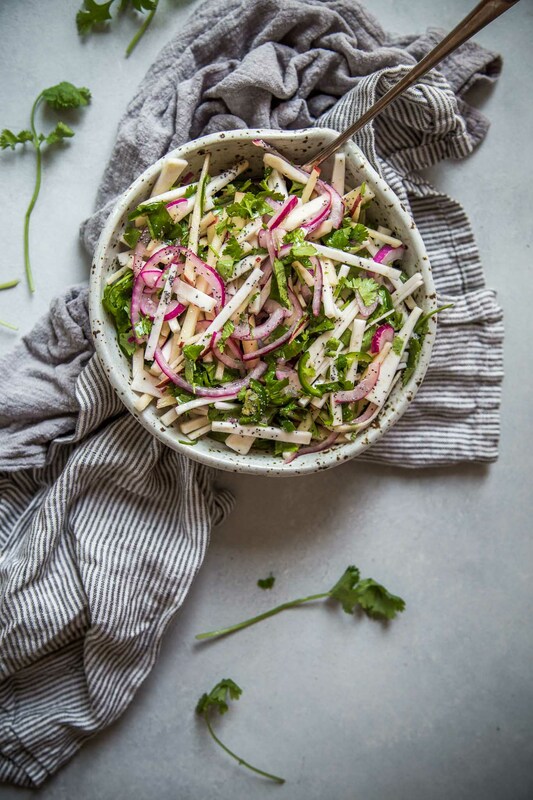 Apple Slaw with Celery Root is an exciting twist on your basic coleslaw. 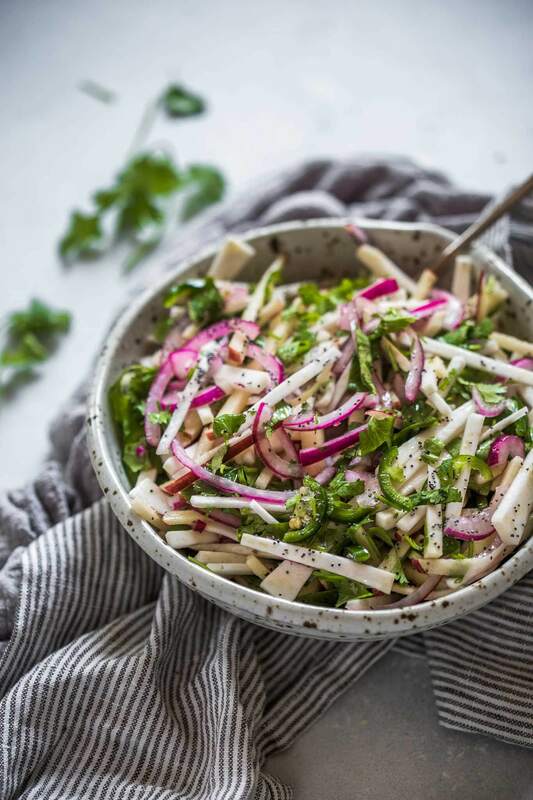 Crisp apples and celery root combine with jalapeno, cilantro & pickled onions. It's sure to be a stand out side dish! Place the vinegar, sugar and 1 teaspoon salt in a medium bowl and add thinly sliced red onion. Massage the onions until well coated with the vinegar mixture. Add oil and set aside for at least 30 minutes. Peel the celery root and cut into thin strips. Core your apples and cut into similar sized thin strips. Place in a large bowl and coat with lime juice to prevent browning. Add the onions and their marinade, minced jalapeno, and cilantro. Toss to combine and top with poppy seeds. If you loved this apple slaw I would appreciate it so much if you would give this recipe a star review! Also, be sure to snap a picture of your finished dish and share it with me on Instagram using the hashtag #platingsandpairings and tagging me @platingsandpairings. Try a dry Riesling, unoaked Chardonnay, or Sauvignon Blanc with this dish. These wines commonly have apple, pear, melon, and even tropical fruit flavors which will match with the flavors in this salad and cut down on the heat from the jalapenos. I teamed up with North Coast to bring you this post. As always, all opinions are my own. I love how colorful this is! What a bright & yummy side dish to balance some of the heavier fall comfort food dishes this time of year. It’s definitely got a good crunch to it Pech! Sounds like a delightful, unusual combo of flavors! How creative! Thanks Hillary – I hope you like it!